Use THIS LINK to suggest songs for our class! You can keep suggesting more all year long. Student Choice - What are my options? We have one rule in room 239. 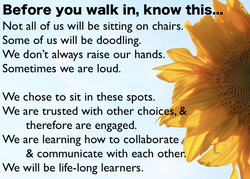 That is, respect for the classroom, the people in it, and yourself. Physical and emotional safety is key. With respect comes choice. You will have many choices this year. The easiest one to see is where you sit, and how you choose to sit. With that choice comes responsibility. Your respectful behavior will insure the continuance of this privilege. * How to show mastery of learning... Do you think the work I ask for could be completed in a different way? It's quite possible! Suggest it to me, and if it respects the reason for the assignment (your learning), it is very feasible. * How to direct the class... If something is happening in class and it makes you frustrated or maybe even uncomfortable, you may choose to propose a new idea for how the class should be going. Complaining about it won't change anything, but suggesting a different way or a new idea might do the trick. Because we are a community with respect for each other, we would consider your suggestion, and it may make the class go more smoothly for everyone involved! * How to communicate... Do you want to share something? Do you have questions? Do you want to ask at the beginning of class so everyone can learn? Do you want to wait to ask until a quieter time? Would you like to talk during lunch, or before or after school? Would you like to email me or leave a message on your a blog? You choose the way you'd like to communicate with me. But please - DO communicate your questions, concerns, and your celebrations. Of course, you always have choices. Every minute of every day. How you choose to act and what you choose to say... these say a lot about a person. How do you want people to think of you? Be conscious of your choices everyday, and please continue to show respect to yourself and others. If you do, we will have a stellar year! You also have the choice to use our supplies responsibly! 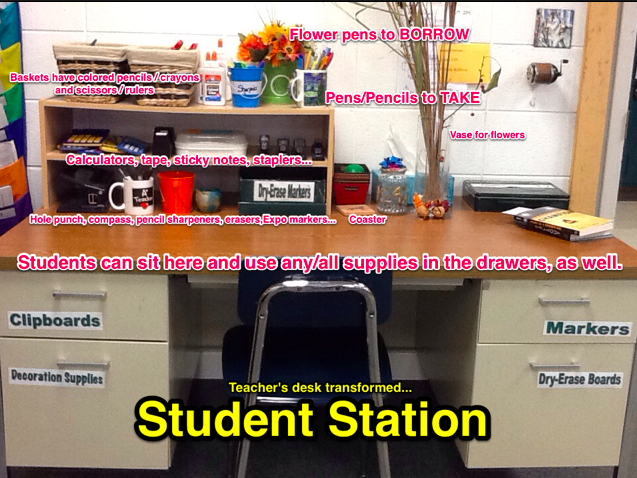 Check out the student station for supplies you may need. Keep it neat and organized, and they'll be available for you all year long.